A content management system (CMS) is an application that allows you to manage content on your website or software application. To most companies this is a huge advantage, as they are able to make content updates without the need of consulting with a developer and updates to your website are immediate. 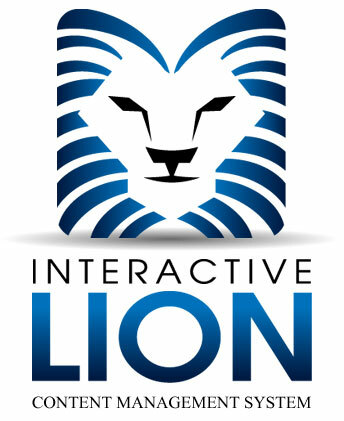 Interactive Lion has incorporated its knowledge of over 15 years to develop, and design, a content management system that will allow you to manage your application, or website, from anywhere in the world with ease. Our CMS platform allows you to build web pages, news articles and forms on the fly without any knowledge of programming. If you are even a little bit versed in using Microsoft Word, you will be able to accomplish tasks that usually require the intervention of a high paid programmer. All of our modules are "code free", meaning you only need to be able to follow prompts and instructions to promote content to your new site. Our WYSIWYG (What You See is What You Get) Editor has all the built in features that you will find in your Microsoft Office Suite. Text, styling, images and links are simply a click away. No more guessing what HTML is and how to make it work! Imagine yourself creating this page that you are currently reading in the same amount of time that it takes you to write a Word document. Askyourself a question, what is that worth to you or your company? The page manager allows you to create simple web pages with only a few clicks of the mouse. We not only give you simple tools to create web pages on the fly, we have also incorporated those important SEO tools right into the Page Manager. META titles, descriptions and keywords are all standard in our tool set. Create your content using our simple WYSIWYG Editor and click Submit. It couldn't be any easier! The menu manager allows you to create and update your website navigation with ease. Our system can handle multiple menus with separate control for each. If you want to have a main navigation and a separate footer navigation, this tool will give you control for each item name, location and link with a click of a button. The Article Manager was built to keep content on your site current. For SEO purposes, having a website that is constantly evolving, through additional content, allows you to obtain those high rankings in search engines. With the Article Manager, you can add news postings to your site, in a chronological order, to not only keep your customers up to date with what is happening in your organization, but to also ensure your website is evolving and growing with content. How easy is it for you to update, or add a field, to your website forms with your current system? MAjority of the CMS systems out in the market will allow you to have web forms, but most are controlled by the web developers that built them. With the Interactive Lion's Form Manager, you will be able to update or add form fields to your existing forms with a few simple clicks. No more need to wait for your web developer to make those changes! Does your company sell products, or services, or do you have a product that you would like to market online? Interactive Lion has the solution for you. With our eCommerce Manager, adding products, groups of products, upsells and options (such as colors, sizes, styles, etc) can be done right from your office computer. We can track inventory, sales tax and even calculate shipping charges with API's provided by a shipping company of your choice. We can even connect with your merchant account to process credit cards automatically. With the help of our Customer Manager, your customer database can be centrally located. No more worries on where to update your customer's account information or where to view orders/activities that they have made on your site, it is now in one location, your new Customer Manager offered by Interactive Lion. The Customer Manager even allows your users to have one login and password to your entire website! Have a large company with hundreds of employees or just looking to have a contact form on your site for the different departments of your organization? The Directory Manager will put all your staff members, or departments, a click a way to your customers. The directory will be searchable and will allow you to control what information, for each employee/department is listed on your site. Every department, or staff, member can have their own contact form on your site, while hiding their Email address from spammers. With a growing company, you will find the need to delegate your Content Management System to multiple employees. With the help of the User Manager, you will be able to create user accounts for your staff to access your new CMS platform while controlling what portions of the CMS they can see.For example, your marketing department might need access to your article manager, but they might not need to see the form manager. You choose who can do what on your new website.